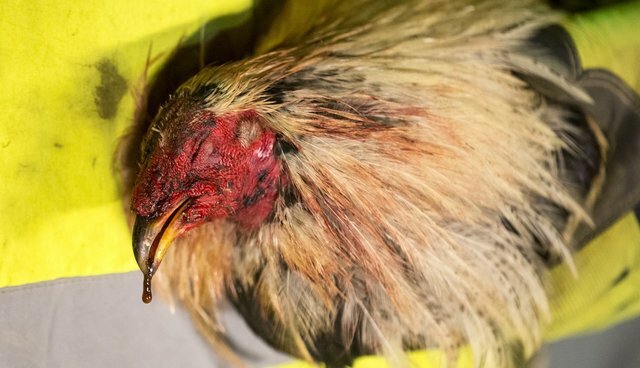 As they broke up an active cockfight this weekend in South Carolina, members of the HSUS Animal Rescue Team and local law enforcement came upon some horrific circumstances. Four birds had just been pulled from the pit, suffering grievous injuries inflicted by sharp knives strapped to their feet, and off to the side, there was a drag pit, where handlers continued to goad birds to fight, even after they had been removed from the main arena because they'd become injured and exhausted. There was also a chained, emaciated female dog with 10 puppies, approximately three to four weeks old, inside a doghouse. Her ribs and backbone were sticking out, her gums pale pink–a sign of anemia. The dog and puppies were shivering from the cold temperatures, and with the female dog having barely any body fat and nursing puppies there was no telling how much longer she would have survived. Law enforcement agents and our team members found plenty of cockfighting paraphernalia and rescued a total of 122 birds that night. Thirty-six of those birds had been transported to the pit for the fight, some across state lines, and the remaining 86 roosters and hens appeared to have been part of a cockfighting breeding operation. The raid also resulted in the arrest of 27 suspected cockfighters. Some parents brought children to the event, and law enforcement officials located firearms and drugs during their search of the vehicles and suspected cockfighters. Ironically, this cockfighting spectacle occurred on the same day that more than 150 South Carolina animal advocates met with their state legislators to voice concerns about anemic anti-cockfighting and animal protection laws. In South Carolina, cockfighting is only a misdemeanor, punishable by up to a $1,000 fine or up to a year in jail. Two bills now in the legislature would crack down on cockfighting. H. 3408, sponsored by Rep. Deborah Long, would criminalize the possession of cockfighting paraphernalia and game fowl with the intent to fight and would criminalize bringing a minor to a cockfight. S. 157, sponsored by Sen. Katrina Shealy, would make cockfighting a second offense felony. Neither bill has received a hearing to date. Other states, meanwhile, are making progress on the issue. Just yesterday, Utah's governor signed a bill making it the 42ndstate with felony penalties for cockfighting, and the Tennessee Senate advanced a measure that increases penalties for spectators and makes it a new crime to bring a child to an animal fight. Many birds and dogs found at the raid were spared a terrible fate, thanks to the Marlboro County sheriff's office and our team. The birds have been transferred by law enforcement to the care of Carolina Waterfowl Rescue and the mother dog and pups have been taken to a local rescue where they will receive medical treatment and proper nutrition. But there is no excuse for South Carolina lawmakers to continue to stall on passing legislation that will, once and for all, clarify that fighting animals for pleasure-and bringing kids to these spectacles of lawlessness and violence – is a serious crime. P.S. Great news from Arizona, where the newly elected Republican governor, Doug Ducey, last night vetoed a bill to weaken anti-cruelty laws for farm animals. H.B. 2150, masquerading as an anti-hoarding measure, would have bifurcated the state's anti-cruelty statute-creating one set of rules for companion animals and another, weaker, one for farm animals and horses. This power grab by Big Ag also would have taken away local control from municipalities, and badly complicated efforts by whistleblowers to expose abuse on factory farms. Kudos to Gov. Ducey for taking this principled stand and for defending animal protection.